A followup to her largely successful and hands-on workbook, The Depression Workbook, this book helps a persona maintain the gains they make in grappling with these disorders. Hundreds of exercises challenge people to use practical suggestions and advice in overcoming the unhelpful thoughts and depressive feelings associated with both depression and manic depression. I feel this is a "must-have" book for anyone who wants help in coping with these disorders. This workbook full of exercises is divided into 18 chapters in four parts. With titles like, "Creating a Support Network," "Fine-Tuning Your Lifestyle," "Minimizing Negative Influences From the Past," and "Making the Most of Counseling," you can tell the pro-active approach the author is expecting from the reader. They need to actively think and be open to changing their way of thinking and feeling in order for this book to effect change in their life. A lot of the exercises are focused on helping you identify your skillsets. 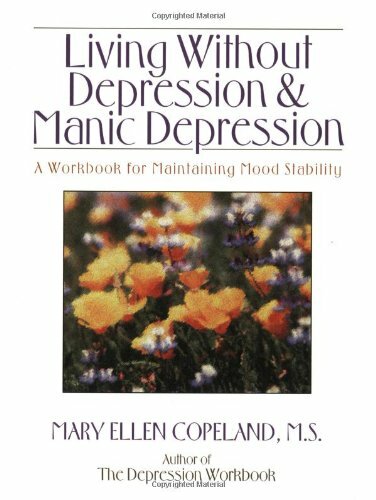 Similar to her first book, but with a more focused approach on specific issues and skills (rather than feelings), the book is oriented toward the "living with" part rather than the "treating" of depression and manic depression. A large part of change involves first explicitly identifying the problems. The author helps you do that with extensive checklists and free-form, open-ended questions. I find that most people find lots of exercises in each chapter to be helpful to them; exercises can be easily skipped if they aren't relevant to the reader.